Spend 365 is a cloud based e-procurement software that automates and tracks purchasing activities across businesses to help them gain greater insights into their spend, reduce risk, and automate the procurement process. Key features include P2P, contract and budget management, RFQ/RFP creation, e-invoicing, reporting, spend analysis, approval routing, and more. The Spend 365 platform offers an all-in-one suite with 9 different modules to help users track purchases across the organization. The procure to pay (P2P) module includes a 3-way matching process which allows departments to control spend and manage financial risk. Each approved order is linked to a purchase order and connected to the supplier invoice, meaning all relevant financial data is linked to a single order. Tools for spend analysis include detailed reports via the spend dashboard which help users to identify spending habits and savings opportunities, as well as manage compliance. Interactive reporting features include a sort and filter function which allows organizations to dig deeper into their procurement data and export results for further analysis and meetings. Users can also produce their own visualizations using the pivot table feature. Spend 365’s supplier management module provides a view of all vendors throughout the entire sourcing process for insights on purchasing for each supplier. The catalog module allows users to add products from the database directly to an order, and the e-catalog connects directly to e-commerce websites in order to purchase products and compare competitors’ pricing. Tools for budget management help businesses track spend performance in real time and include a detailed budget analysis. Users can send out requests for proposals and quotations in minutes using Spend 365’s RFP/RFQ module, and allow suppliers to submit their responses directly within the portal. Users can monitor supplier activity across all sourcing activities via the supplier evaluation module, as well as compare and update responses, and view detailed price breakdowns. All contracts are stored electronically within the contract module, complete with contract expiry notifications, customized notifications, and contract analysis. Aesthetically its great which makes it so easy to use, navigate around and settle in to. Other systems weve tried have felt so clunky and complicated that we havent known where to start. Anyone looking to move away from the days of Excel should really consider trying this out. Also, pricing is very competitive in comparison to other options we tested which dont really offer any more functionality. Overall it took us very little time to get to grips with this and absolutely love it- would wholeheartedly recommend it to anyone who still uses Excel and knows they should be moving away, or to anyone who is spending too much elsewhere. So far, nothing has sprung up that i can genuinely say has put me off. Its early days but very happy! Really user friendly, very powerful, feature rich, great to move away from excel spreadsheets. Love the spend analysis dashboard. Great price and really easy to use. Similar software's we tried only gave P2P and one other module for the same price however using Spend 365 I can manage my contracts, budgets and create as many RFQ's as I like. Nothing. Easily the best out of the ones I tried and a great price. Can't fault it really, thoroughly enjoyable experience. Very interactive, I can analyze spend and manage all contracts within the platform. Really quick and easy to learn. They have said the software will have further third party integrations towards the end of the year which will be of great interest. Spend 365 offers Basic, Premium, and Executive packages. Contact Spend 365 for a quote. Discount available for non-profit organizations. Spend 365 is a SaaS e-procurement solution offering an all-in-one, 9 module suite all under one platform to help organizations control spend and manage financial risk. Move away from receiving multiple spreadsheets from departments and subsidiaries with Spend 365's high level, detailed reporting for identifying spending habits and savings opportunities. 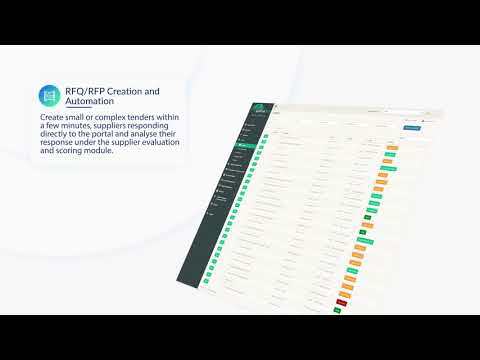 Evaluate supplier information and prices under a single dashboard, and allow suppliers to submit their RFP/RFQ responses direct to the Spend 365 portal. Avoid constantly updating contract register spreadsheets with Spend 365's contract management module which stores all contracts electronically, complete with expiry notifications, contract analysis, and more. Spend 365 offers an API and connects with popular third party accounting softwares and ERPs, allowing data to interact automatically between systems such as QuickBooks, Xero, Sage, SAP and more. Below are some frequently asked questions for Spend 365. Q. What type of pricing plans does Spend 365 offer? Q. Who are the typical users of Spend 365? Q. What languages does Spend 365 support? Q. Does Spend 365 support mobile devices? Q. Does Spend 365 offer an API? Yes, Spend 365 has an API available for use. Q. What other apps does Spend 365 integrate with? Q. What level of support does Spend 365 offer?